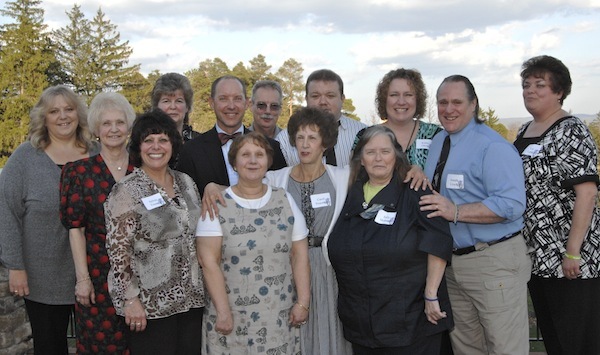 JAMESTOWN – Over one hundred employees of Lutheran Social Services were honored at the 34th Annual Employee Recognition Banquet held at Moon Brook Country Club. Honorees had reached milestones ranging from two years of service to forty-five years. Included in those recognized were 14 employees with over 20 years of service. Collectively they have served more than 400 years. Sal Lee Holland, food service associate, has been with Lutheran for forty-five years. Sal Lee began her career two days before Christmas in 1966. “At that time our campus probably had more livestock than employees,” Holt said. “We consisted of the GA Orphanage and the retirement home. Much of our history can be written following Sal Lee’s years serving our residents.” Sal Lee has been a steadfast employee who has been willing to change with the times, continually updating her skills and learning new things. Lutheran Social Services employs approximately 600 people and is always looking to add exceptional workers to their team. Lutheran offers a wide variety of career opportunities through GA Family Services for youth and the numerous programs that serve older adults. To learn more log onto www.lutheran-jamestown.org.